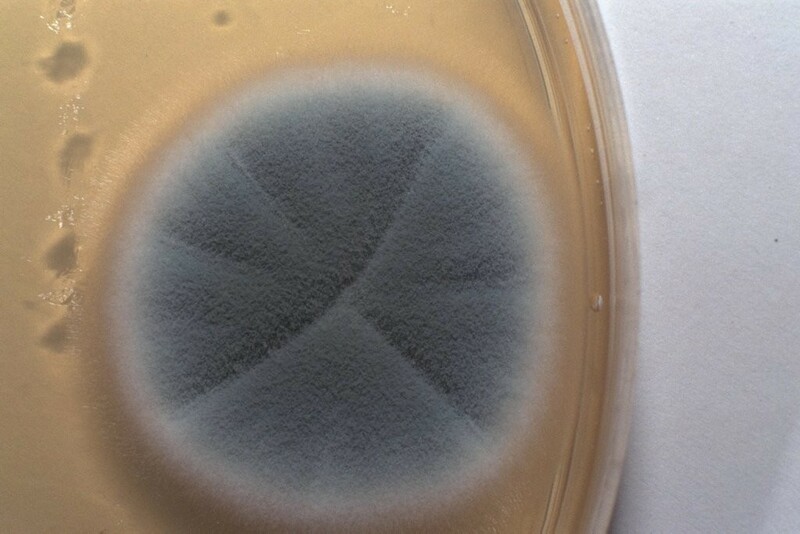 Fungi in the phylum Zygomycota are called zygomycetes. The zygomycetes are terrestrial. They are usually saprotrophs but there are some parasites. The hyphae are coenocytic (theyn lack septa). Septa are found only in the reproductive structures. Fusion of two hyphae leads to the formation of a zygosporangium, a thick-walled structure that is capable of surviving environmental extremes. Before karyogamy, the zygosporangium contains many haploid nuclei. after karyogamy, it contains many diploid nuclei. Asexual reproduction involves mycelia producing sporangia that produce haploid spores by mitosis. The spores produce new mycelia. When environmental conditions deteriorate, sexual reproduction may occur. Hyphae from opposite mating types produce structures that contain several haploid nuclei. Fusion of two of these structures from opposite mating types results in a heterokaryotic zygosporangium. A thick wall develops that functions to protect the zygospore until environmental conditions become favorable. When conditions are favorable, nuclear fusion (karyogamy) occurs within the zygosporangium producing diploid nuclei. This is followed by meiosis. The zygosporangium then germinates to produce a sporangium which releases haploid spores. Figure 4. Morels (left) are sac fungi. Photo courtesy of Michael Lawliss. Ascomycetes are important in digesting resistant materials such as cellulose (found in plant cell walls), lignin (found in wood), and collagen (a connective tissue found in animals). This group also includes many important plant pathogens. 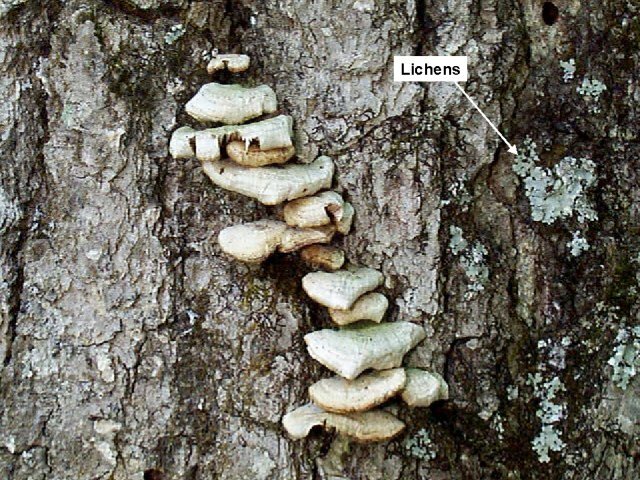 Many, perhaps half of the species of ascomycota form lichens—a symbiotic relationship between a fungus and a photosynthetic cell such as a green algae or a cyanobacteria. 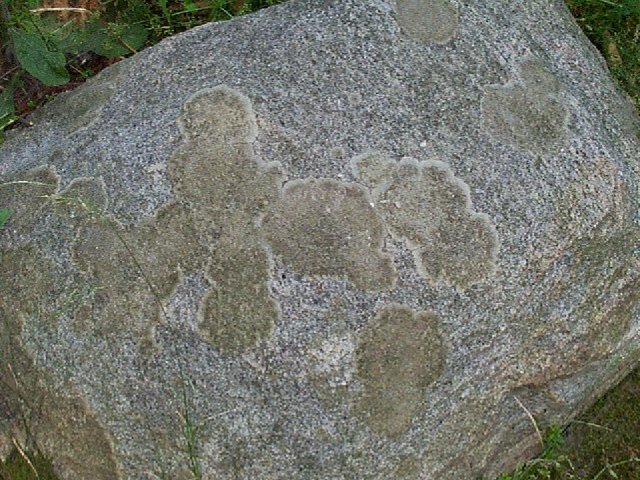 The fungal component of most lichens is an Ascomycete. Hyphae from opposite mating types fuse, forming a heterokaryotic structure which then produces dikaryotic hyphae. The fruiting body is called an ascocarp. It is composed of dikaryotic hyphae and haploid hyphae. 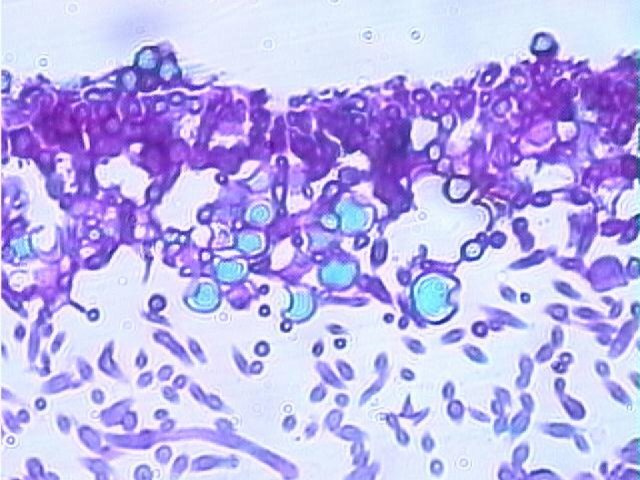 Dikaryotic hyphae within the ascocarp produces asci (singular: ascus), sacs that are walled off from the rest of the hyphae. Nuclear fusion within an ascus will produce a diploid zygote. The zygote will undergo meiosis, followed by mitosis to produce 8 haploid ascospores. 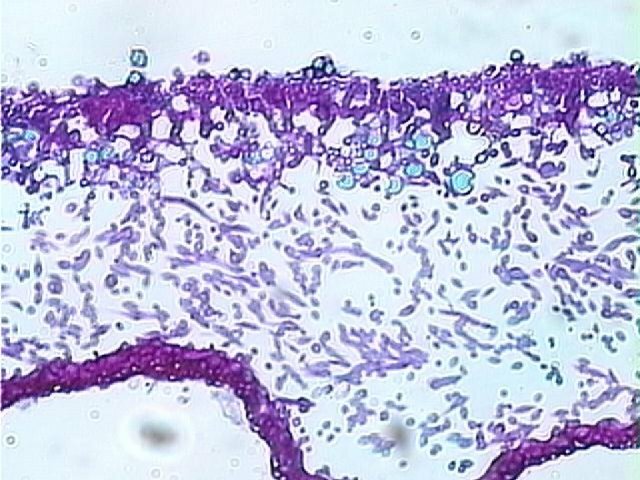 Asci with ascospores can be seen in figure 5. Figure 5. Peziza cross section X 200. 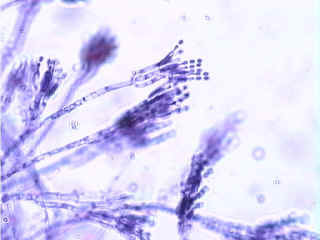 Most reproduction is by asexual spores called conidia. 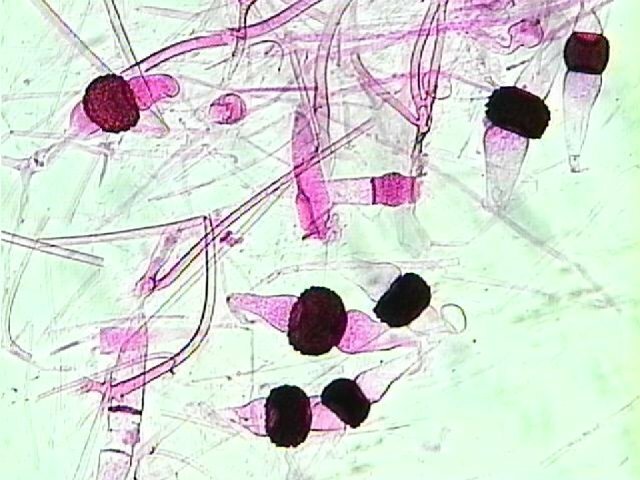 Unlike the Zygomycetes which produce asexual spores within sporangia, conidia are produced on the ends of specialized hyphae called conidiophores. 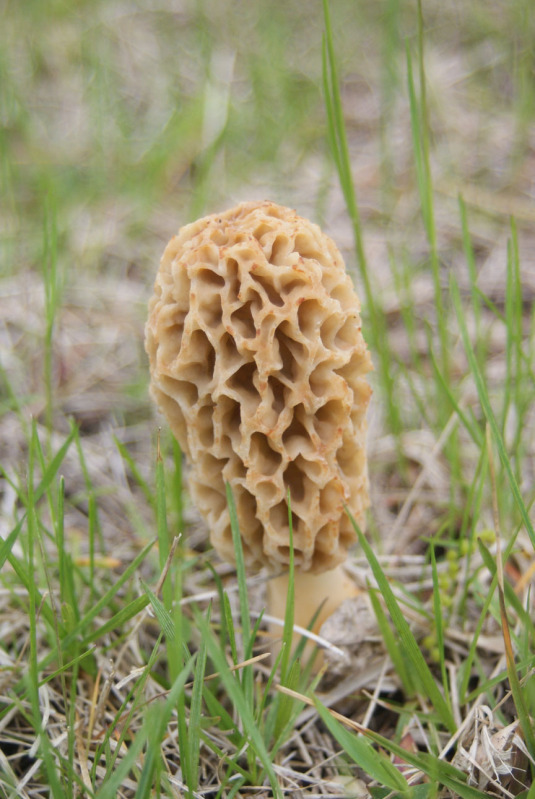 Morels and truffles are gourmet delicacies. 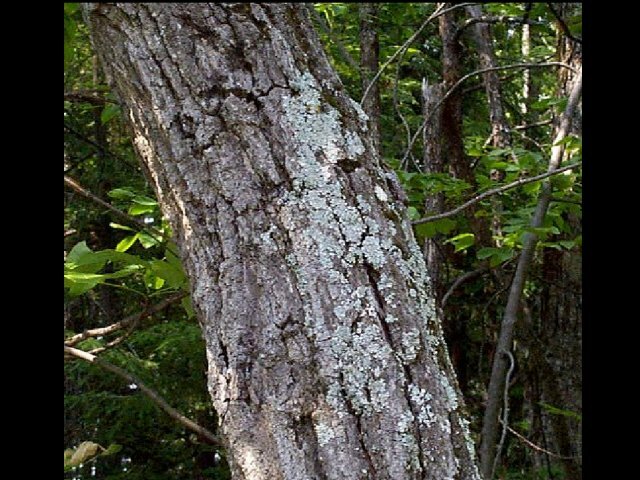 This group includes many important plant parasites such as Dutch elm disease, chestnut blight, leaf curl fungi, and Claviceps. An ergot is the hard, purple-black fungus Claviceps purpurea. It contains toxic alkaloids, including LSD. When infected rye is made into bread, the toxins are ingested and cause vomiting, muscle pain, feeling hot or cold, hand and foot lesions, hysteria and hallucinations. Historians believe that those that accused their neighbors of witchcraft in Salem may have been suffering from ergotism. Claviceps is used to stimulate uterine contractions and to treat migraine headaches. Yeast are single-celled members of the sac fungi. Most reproduction is asexual; a small cell pinches off from a larger cell. This type of mitosis where a smaller individual grows from a larger individual is called budding. Make a wet mount of live yeast and see if you can observe budding under high power. 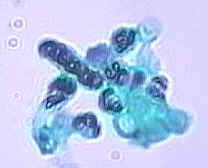 If you cannot see yeast budding, view a prepared slide of yeast budding under high power. Figure 6. Yeast (Saccharomyces) budding X 1000. During sexual reproduction, the fusion of two cells results in the formation of an ascus. The elongated cell in the upper left part of figure 7 contains ascospores. Cells in the lower left part of the figure 8 contain ascospores. Yeast is important in leavening bread by CO2 production and in producing ethanol for alcoholic beverages. Figure 10. Penicillium Conidiophores and conidia X 400. Asexual reproduction in club fungi is rare. 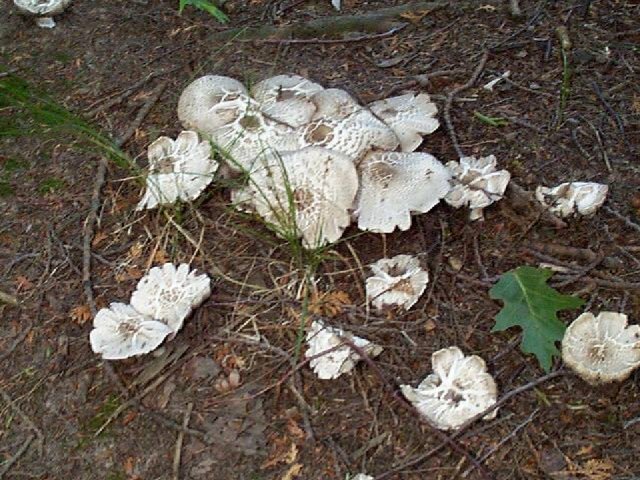 Their fruiting bodies are called basidiocarps. This is the visible mushroom. 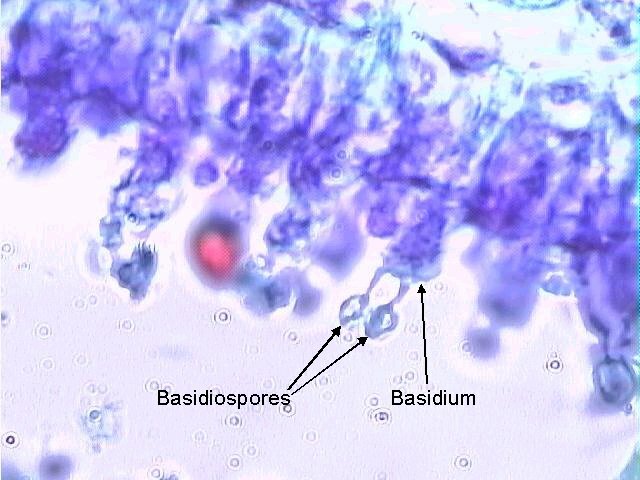 Spores, called basidiospores are produced on basidia within the basidiocarps. 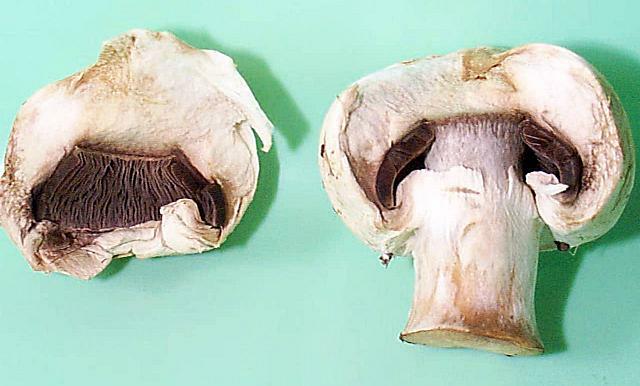 In mushrooms, the basidia are located along the gills on the underside of the cap. 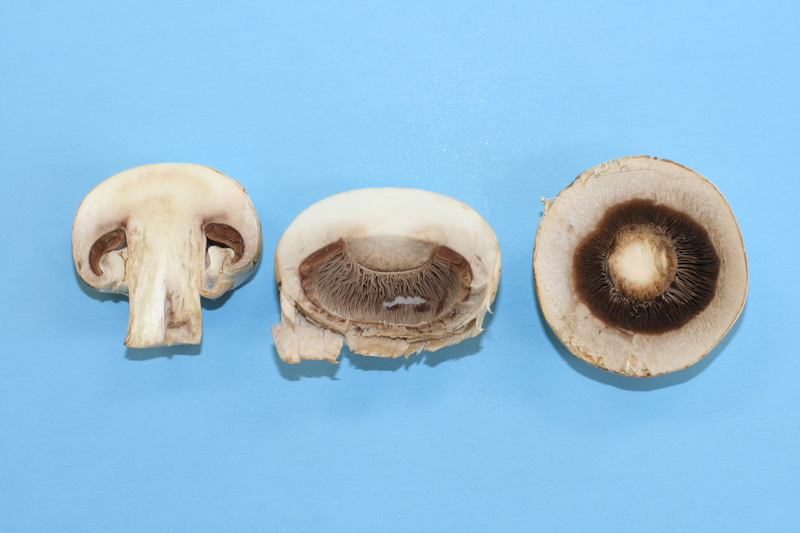 In figure 6, a portion of the cap of this mushroom has been broken away to reveal the gills. 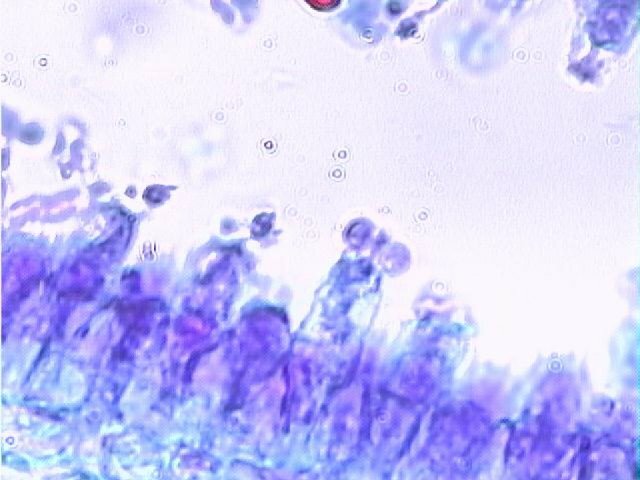 In ascomycota (sac fungi), the ascospores were enclosed in an ascus. In basidiomycota, the basidiospores are not enclosed. 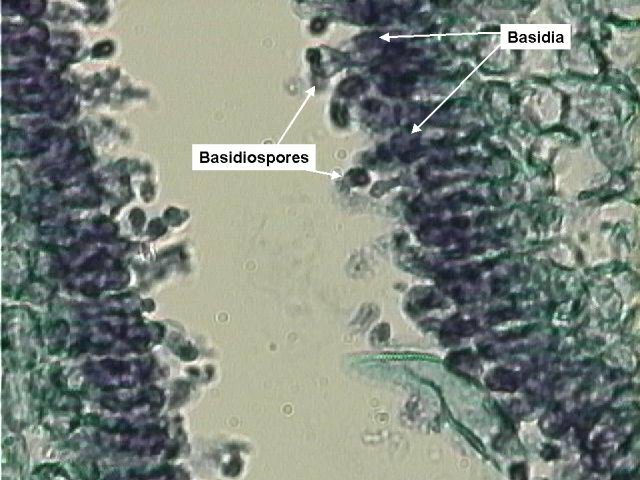 Compare the diagrams of a basidium with basidiospores above with that of an ascus with ascospores seen earlier. 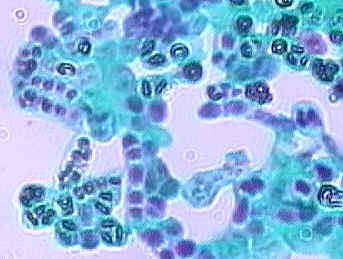 Basidiospores germinate to produce monokaryotic (haploid, one nucleus per cell) hyphae. 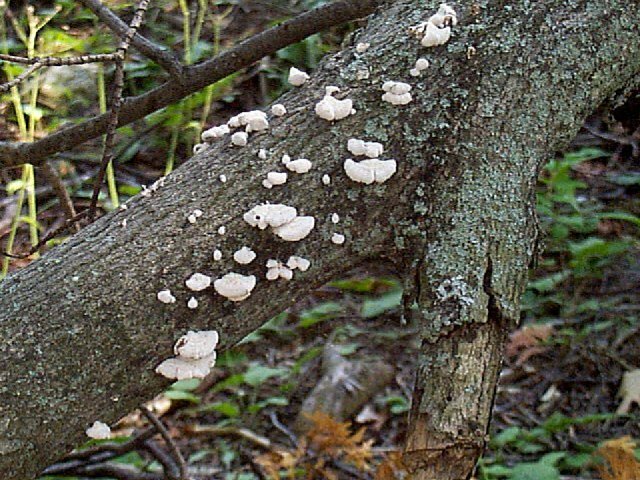 Mushrooms are composed of dikaryotic hyphae which are formed when hyphae fuse. Dikaryotic nuclei within the basidium fuse to produce a zygote and meiosis then produces basidiospores. Cut a mushroom to reveal the gills as shown in figure 16. Basidia and basidiospores form on the gills. 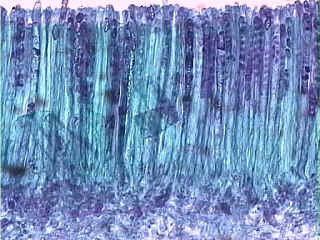 The photosynthetic cells are contained within the middle layer. 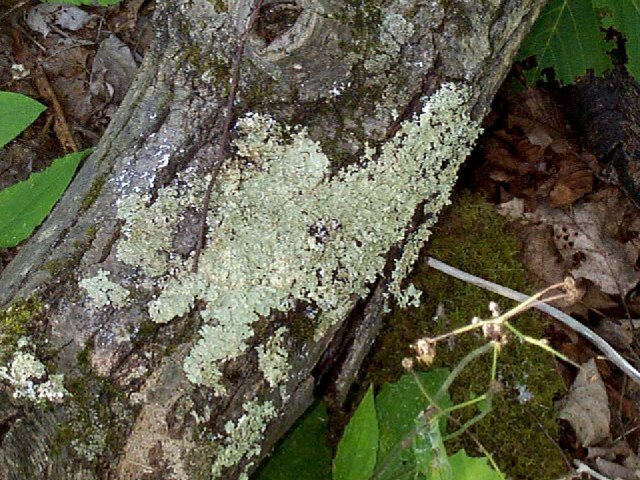 The photosynthetic cells provide photosynthesis for the lichen. It was thought that the relationship was mutualistic because the fungus prevented the algal cells from desiccation. Recent evidence indicates that the photosynthetic cells may grow faster when separated from the fungus. Perhaps the fungus is parasitizing the photosynthetic cells. Reproduction is asexual. 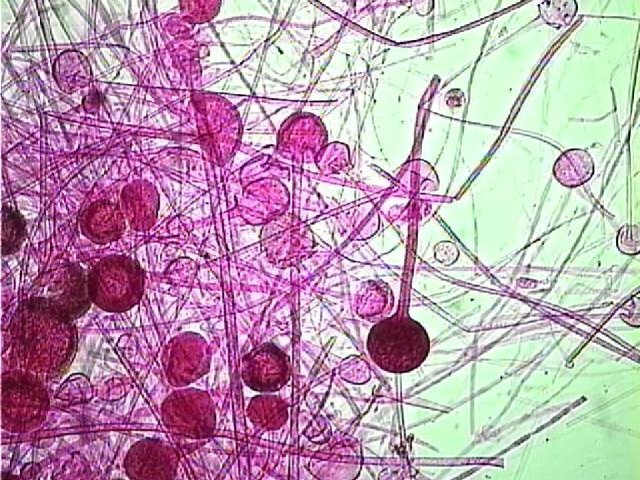 Fragments are produced that contain fungal hyphae and photosynthetic cells. Lichens derive most of their water and minerals from rainwater and air. This allows them to survive on bare rock, tree trunks, inhospitable places.